Senior Ryan Pearson went off for a career-high 35 points and added a game-high 14 rebounds to power the George Mason men’s basketball team to an 84-76 victory at College of Charleston on Friday night at a sold-out TD Arena. The victory improved Mason’s record to 9-4 while the Cougars (10-3) saw their 15-game home win streak, tied for 11th longest in the nation, come to an end. The win was Mason’s first over the College of Charleston ever, snapping a three-game losing streak against the Southern Conference foe. Pearson was one of three Patriots in double figure scoring, as sophomore Vertrail Vaughns contributed 12 while classmate Bryon Allen had 11 points. Five Cougars scored in double digits, led by 19 points from Antwaine Wiggins who also pulled down a team-high nine rebounds. Mason out-shot the Cougars by a 51.7-to-43.3 percent margin, including 50 percent from beyond the arc (8-of-16), while converting 13 CofC turnovers into 25 points. Pearson’s scoring tally, among the top-20 performances all-time by a Mason player, is the highest output since Lamar Butler had 36 points seven years ago to the day in a 76-65 win at Morehead State. It was also the third-highest scoring total by a player at the four-year old TD Arena. Charleston opened on an 8-0 run but the Patriots quickly countered to cut the margin to one-possession at 8-5. The Cougars preserved the lead, going up by as many as seven at 19-12, before Mason responded with a 9-0 run to give the Patriots their first lead at the 11:06 mark on a bucket plus the free throw by Pearson, one of four such plays he produced in the first half. The difference remained within one score, switching sides four times before five Patriot points in a row made it 31-26 inside of six minutes left in the first half. Mason went on to open up a double-digit lead, as large as 11 when another Pearson 3-point play made it 41-30 with 102 seconds remaining. The Cougars got it back to single digits when Anthony Stitt’s layup with 3.8 seconds showing on the clock went in, setting the halftime margin of 46-38. It was the Patriots’ largest lead on an opponent court at halftime this season, and also Mason’s most productive first half of the year. Pearson scored 19 points in the frame, to lead all scorers. The Patriots never trailed in the second half, but by no means did they run away with the win. Down 11 at 70-59 with 6:24 remaining, the Cougars rallied to close within two after a Stitt 3-pointer made it 74-72 with 3:09 left. Mason pushed it out to two possessions on a Pearson jumper inside of two minutes, and Charleston got no closer than four from then on. After a Matt Sundberg layup made it 80-76 with 20 seconds to go, Mason iced the win with two foul shots each from Allen and senior Mike Morrison. 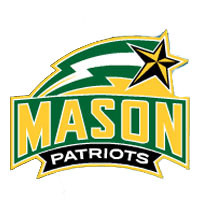 Mason returns home to resume Colonial Athletic Association play on Monday afternoon, battling William & Mary at high noon in the Patriot Center.